Kylun comes to Earth (or Earth-616, technically) this issue, and it's revealed that he's Colin, the young boy whom Widget teleported away from Vixen in issue #2 of the series. 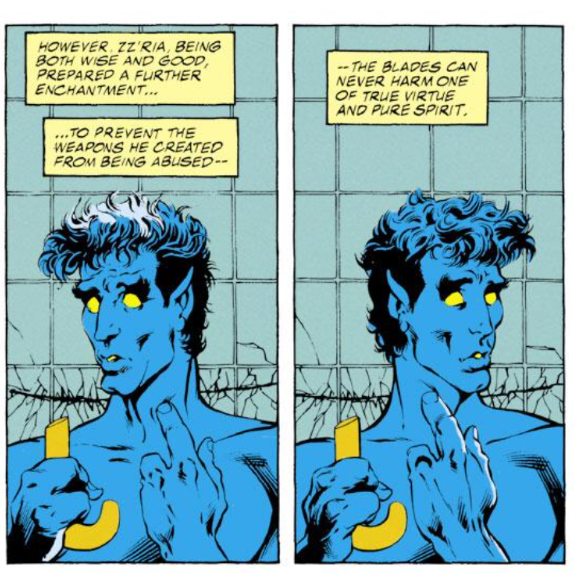 He proceeds to tell Nightcrawler what happened to him between that issue and his next appearance in issue #42. 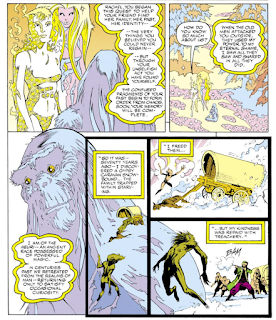 He arrives in pursuit of Necrom, and it's established that time works differently between Earth and Ee'rath, allowing for Necrom to have arrived on Earth long ago enough to have orchestrated the museum heists of the last few issues even though he saw him leave Ee'rath only moments before Kylun in this issue. This issue reveals that the alien world Nightcrawler accidentally stumbled on in the first issue of the series was Ee'rath, just moments before the birth of Princess Sa'tneen. 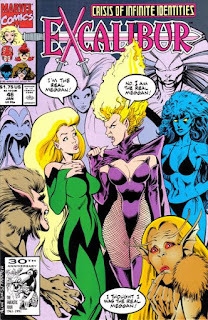 Meggan's pursuit of her parents, which is ultimately fruitless but does work to answer some questions regarding her identity, brings her into contact with one of the Neuri, the mystical primate-like people who first appeared in Wolverine: Bloodlust, by Claremont and Davis. 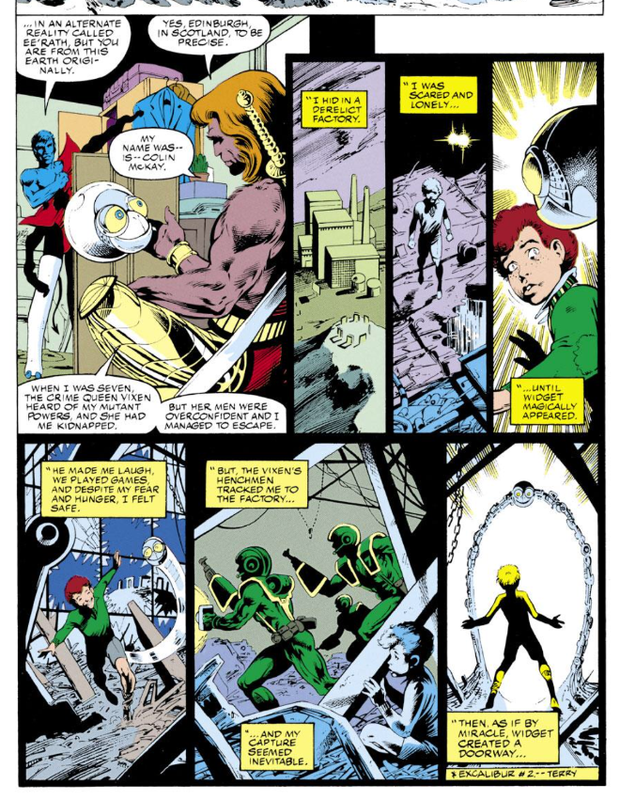 On Ee'rath, Excalibur's lighthouse, which we learned last issue is static across the multiverse, is referred to as "the tower that crosses time". Kylun's swords are unable to harm anyone of true virtue and pure spirit. 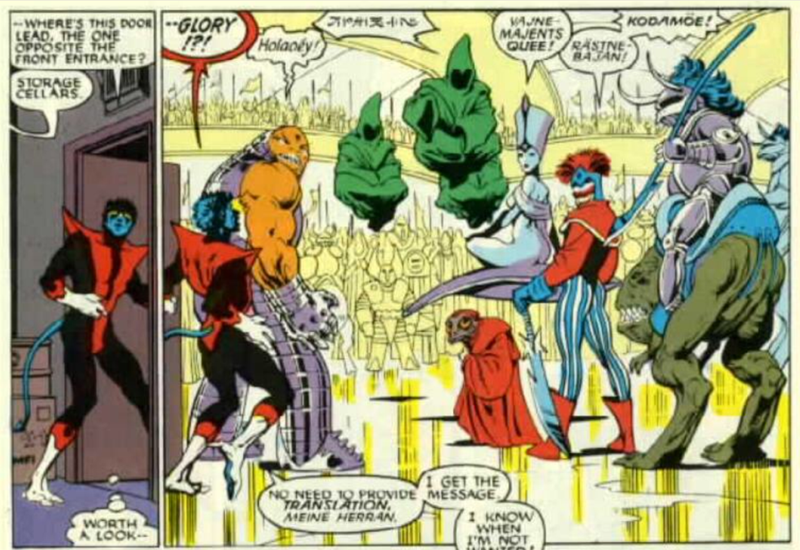 Widget builds himself a body this issue, appearing as something other than a floating head for the first time. 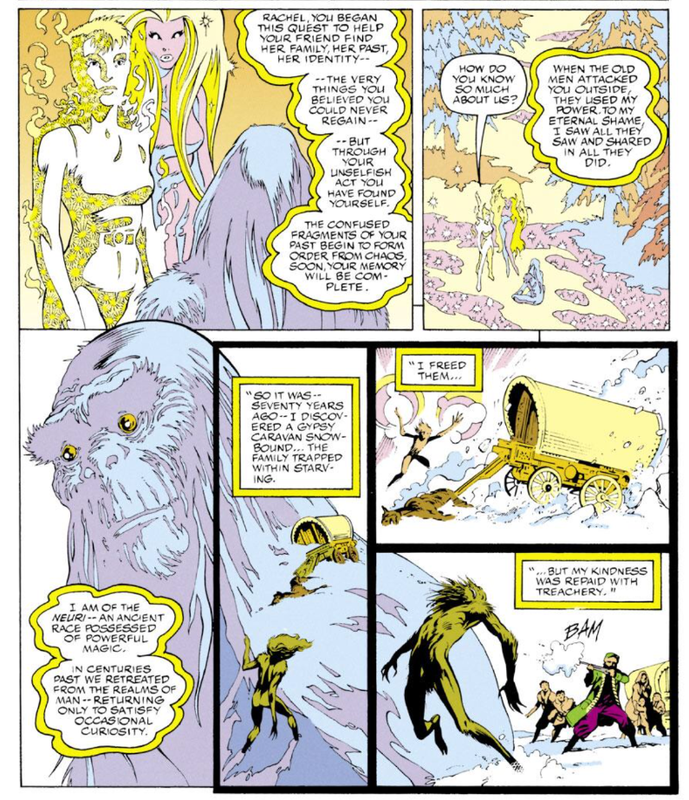 Ever so slightly, Davis begins to tie his plot threads back together in this issue, bringing an apparent end to Meggan's search for her parents and Kylun back to Earth (in the process, referencing some of the oldest issues of the series), while also establishing how Necrom came to be on Earth-616 last issue, prior to his fight with Kylun on Ee'rath. Beyond that, there's not a whole lot else to say about this. Excalibur under Davis remains the gem of the line, with the book clicking on multiple levels such that it's an enjoyable read even independent of the fact that Davis is also doing a massive cleanup of the series' dangling narrative threads along the way (and much of the whimsy that characterized the earlier collaborations between Claremont & Davis, which always held me back from fully embracing the series, is being downplayed as well). But that also makes it difficult to come up with things to write about beyond saying "it's good" over and over. But is is, nevertheless, quite good. Tomorrow, Wolverine confronts his past in Wolverine #50. Next week, Uncanny X-Men #285 and X-Force #6. I agree with your take. Mostly good stuff going on here of the sort that Davis is... good at. I found it quite odd, however, for Colin’s story — which even includes mention of making Widget his “totem” — to leave out any explanation of how (or even reference to the fact that) he became a cat-person. Didn't he have catlike eyes in his very first appearance as a child? I just figured he grew up that way as part of his mutation. Well, I confess that I remembered neither his catlike eyes from #2 nor even the fact that he was a mutant; I just recalled him being a kid who stumbled across Widget and got sent through a portal. 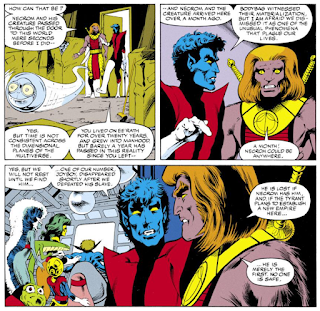 I don't remember him having cat-like eyes (or any indication he was a mutant) in issue #2. Somewhere along the way, it gets established that part of his mutation led to him becoming a cat-person, but I don't know when that gets established (I just know it from Wikipedia/trading cards). To your point, Blam, it is odd that no mention of his cat-personess is made in this issue - even if it does get established why later in the series, seems like it would be a bigger question to answer first, before, say, the idea of Widget as his totem. (And, to be clear, I'm not faulting Nightcrawler for failing to ask about - for all Nightcrawler knows, Colin, like himself, was born a cat-person. It's only we, the audience, who know he wasn't a cat-person during the events he's citing in this issue). He had slit cat-like irises in #2, and he says that Vixen's men told they had been offered a lot of money for taking him and called him a mutie. I just checked up. 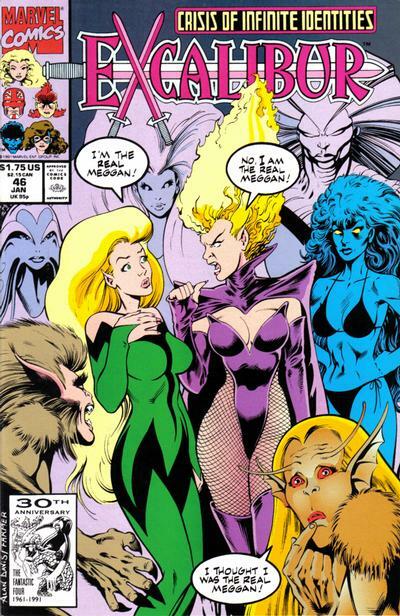 Vixen probably wouldn't be so interested on a plain regular kid.